15 h.p. & 10 h.p. Weight 70 lbs. & 62 lbs. 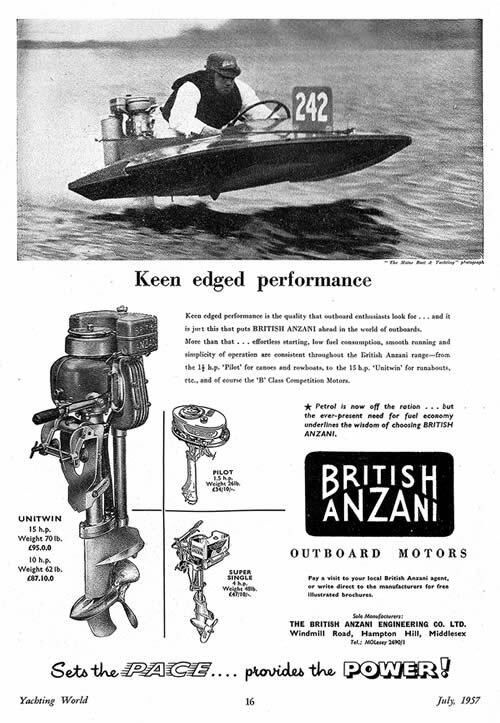 Keen edged performance is the quality that outboard enthusiasts look for... and it is just this that puts BRITISH ANZANI ahead in the world of outboards. More than that... effortless starting, low fuel consumption, smooth running and simplicity of operation are consistent throughout the British Anzani range - from the 1 1/2 h.p. 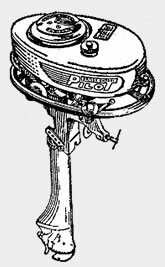 'Pilot' for canoes and rowboats, to the 15 h.p. 'Unitwin' for runabouts, etc., and of course the 'B' Class Competition Motors. 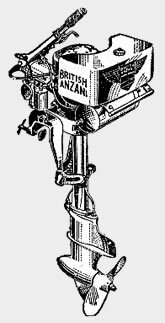 Petrol is now off the ration... but the ever-present need for fuel economy underlines the wisdom of choosing BRITISH ANZANI. Sets the PACE... provides the POWER! Click on the British Anzani advertisement from a 1957 copy of Yachting World above for a larger view.